Early each year we start to think about possible destinations for our annual long weekend jaunt to somewhere in European mountains. After several years trips the challenge is to find somewhere that we haven’t been to, has decent mountains (ideally fairly high with huts) and reasonable regular/cheap flights. 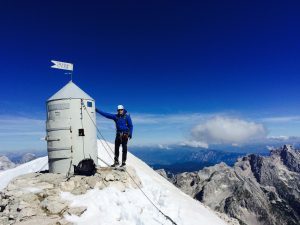 After the Polish Tatra mountains last year we decided to take a look at the Julian Alps and investigating route options for Mount Triglav, the highest peak in Slovenia. 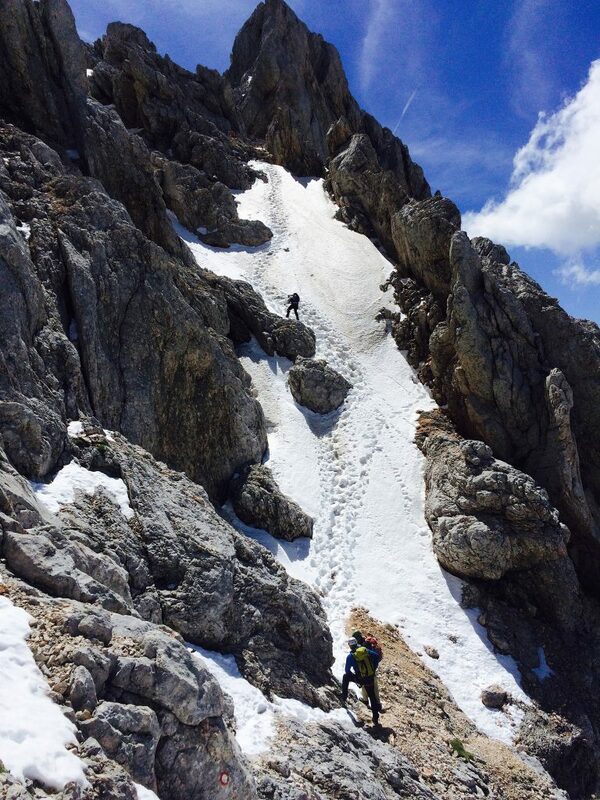 Timing is important – we tend to go early in the season to avoid the crowds but when the Alps still hold some snow. This can prove to be a bit of a gamble particularly when booking flights in advance – too early and the routes may be blocked by snow or the huts even closed. We often opt for the first week the mountain huts re-open after the winter break. A bit of web research pointed us to mid June. 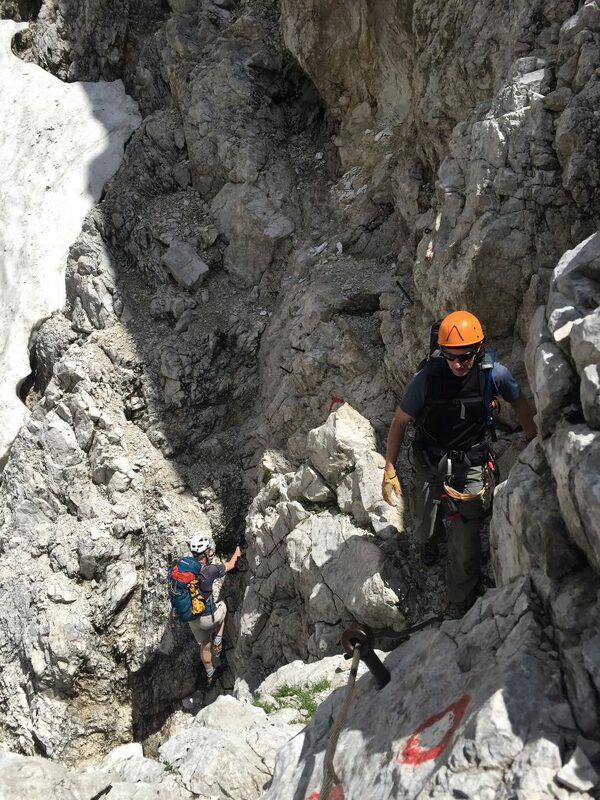 Velimir, whom I met on Twitter @VKemec, was really helpful in checking local weather reports and conditions on the mountain, particularly as we had to make decisions on kit and whether to take ice-axe/crampons/harness/helmet/via-ferrata gear. Flying out on Wednesday late morning we landed in Ljubljana, quickly changed into our mountain clothes, re-sorted the rucksacks and jumped in a taxi to the beginning of the trail at Mojstrana. 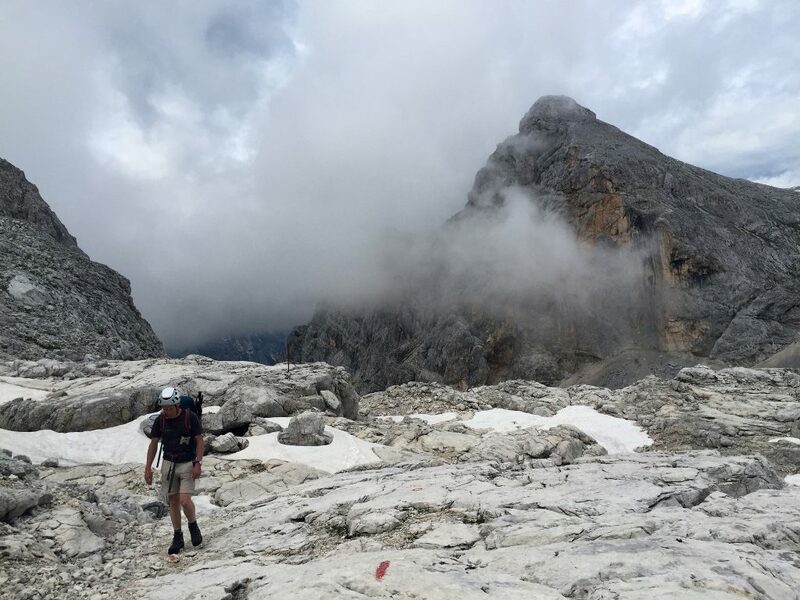 It was some kind of record as within 40 minutes of touch-down we hit the trail, with a 10km meander along the Vrata valley bringing us to the Aljažev Dom hut, the traditional start point for several Triglav routes from the north. We had decided upon the Tominskov pot route put up by Slovenians in 1903. 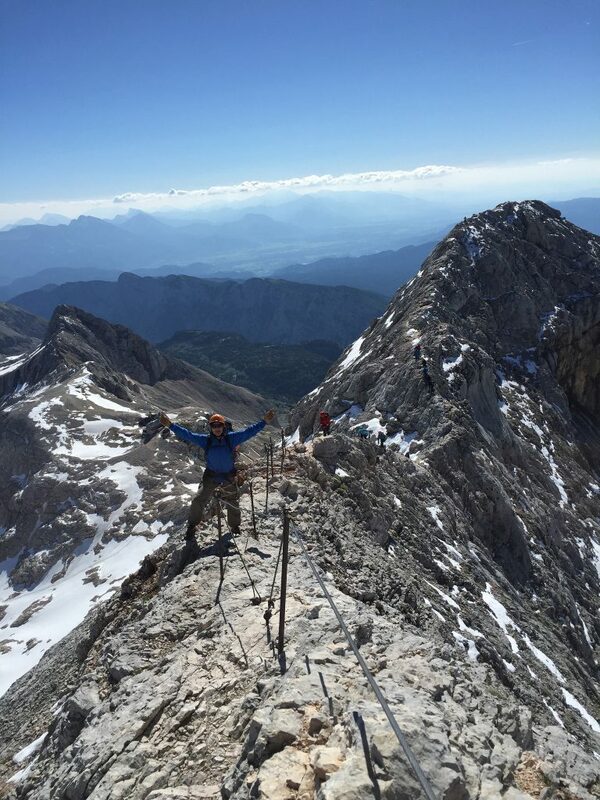 Summitpost has a good Triglav route summary here. The next morning the sky was bright blue. 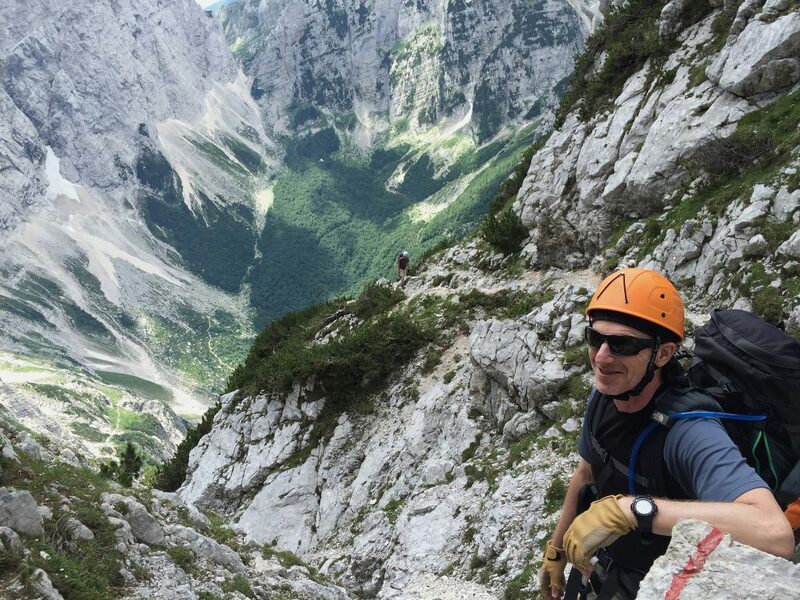 We were surrounded by seemingly impregnable steep limestone cliffs that form the north face of Triglav. Looking upwards it was difficult to imagine how the sheer faces could be negotiated via a path, there being no obvious lines of weakness visible from this far down. We located the start of the Tominskov pot, which immediately headed steeply upwards through the treeline. After a couple hours we were out of the tree line and weaving our way up what appeared from below to be an impregnable wall. The valley below was enclosed on three sides by steep cliffs and jagged peaks. The path weaved itself upwards alternating between easy path and more precarious stretches protected by cables and ladders. From our position I wasn’t quite sure if we could see the peak of Triglav, but around each corner the view seemed to extend forever upwards. We stopped for a quick lunch break on an outcrop known as ‘Bife’ which was covered in bright green grass and such a stark contrast against the harsh grey rock all around. We could pick out a couple following up the path below us – only then could we make some sense of the scale of the arena we found ourselves in. Looking back at the photos now I’m still in awe at some of the vertiginous positions. We continued upwards and passed our first patch of snow, a remnant from the previous winter, but as we ascended they became more common. 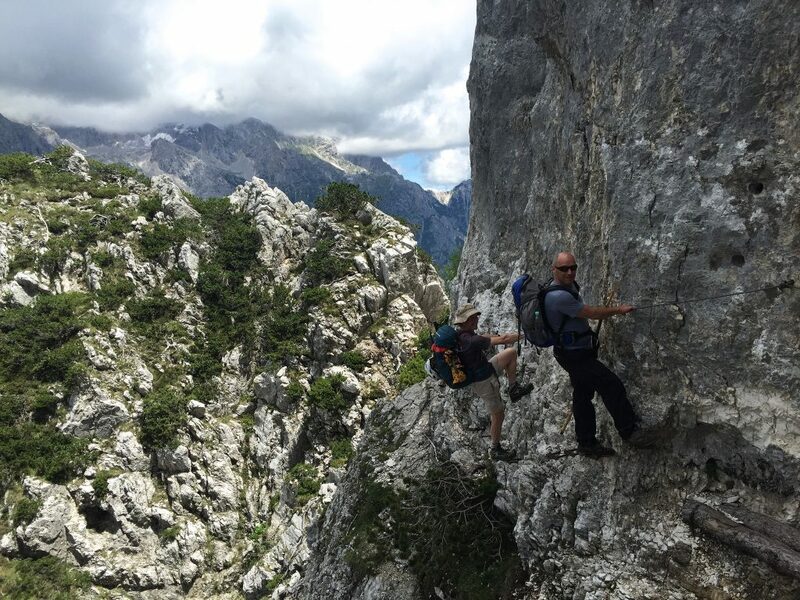 As we reached a huge karst plateau plateau the incline eventually relented. To the left perched on an outcrop we could see the Stanicev Dom hut but we were headed directly across the plateau to the Kredarica hut at 2100m. The blue sky has given way to low cloud as we approached a bowl where the snow was reasonably deep. We followed a well worn track through the snow until eventually we reached the hut, just as the visibility all but disappeared. It had been a tough climb but we’d reached our destination for the evening. The Kredarica hut had only been open a few days and apart from the restaurant was freezing cold. An expensive beer and goulash set us up for an early evening. 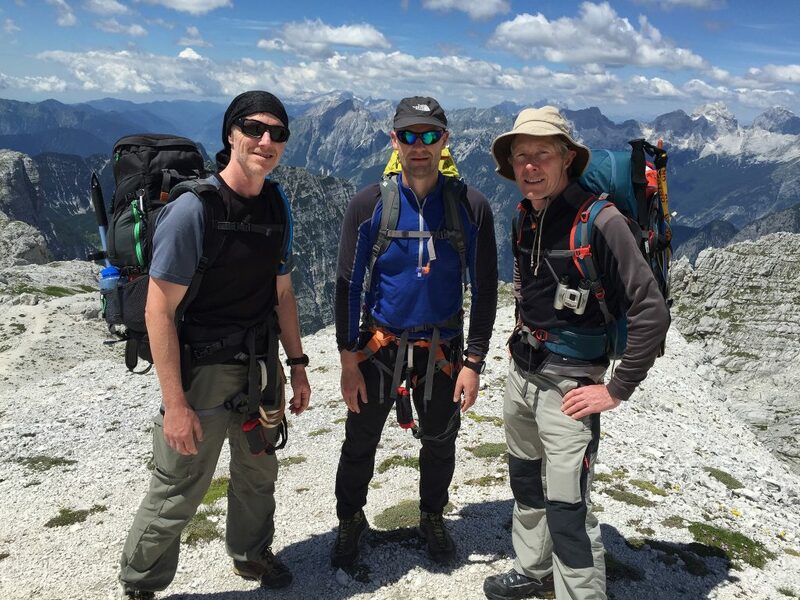 We knew that Triglav summit was only a few hundred metres of ascent in the morning. We awoke to clear blue sky and fantastic views. 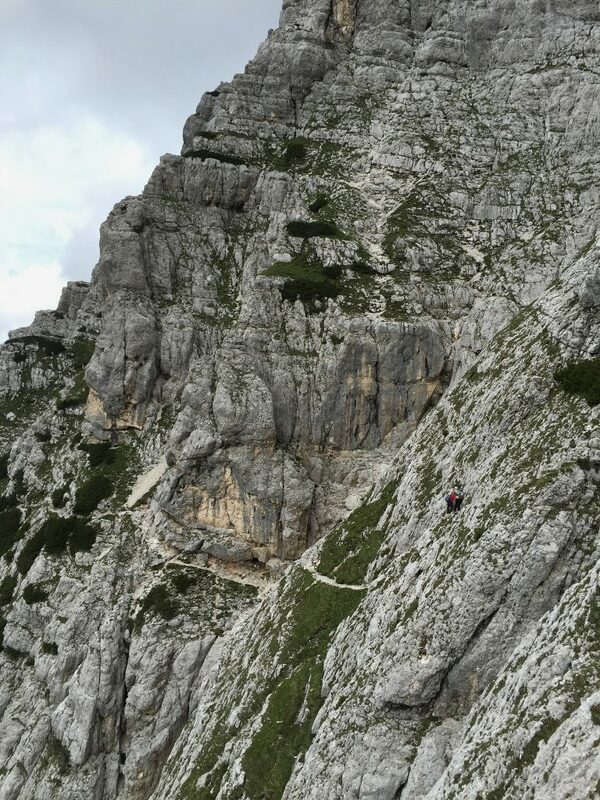 By the time we re-packed there was already a small trail of bodies making their way up the cabled path that would take us all the way to the summit. 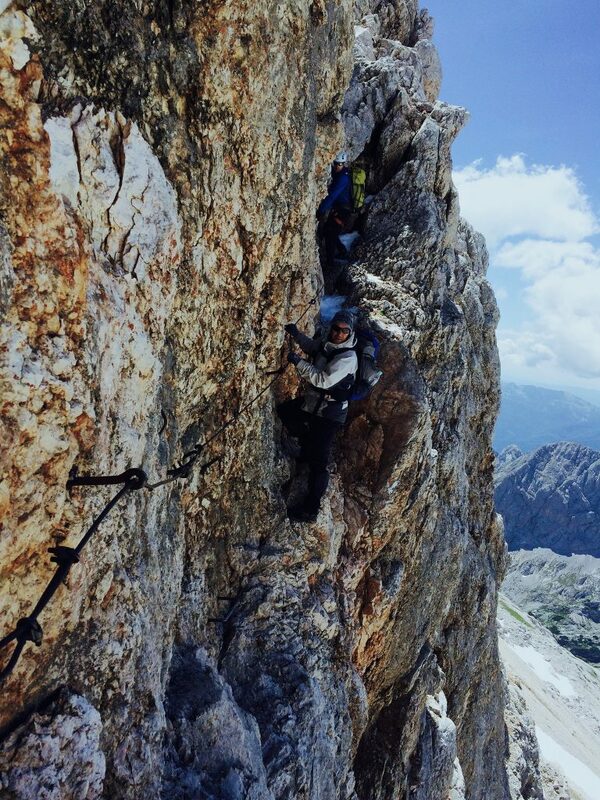 The route followed a steep incline with plenty of staples and cables for protection before joining a seemingly razor-sharp ridge line all the way up to the summit, replete with its emergency shelter. 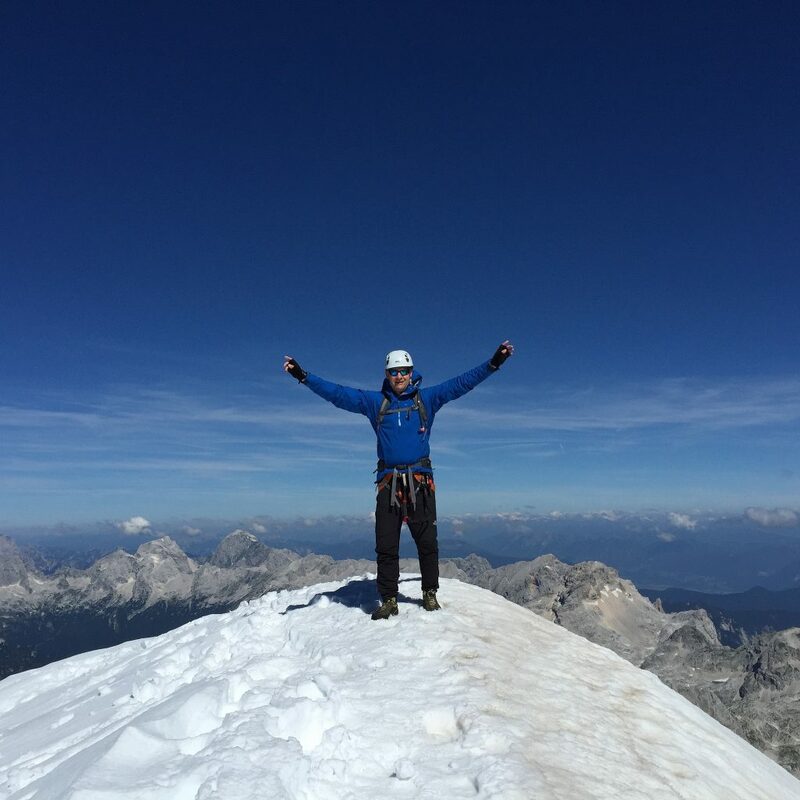 Just past the shelter a snowy mound appeared to mark the true summit and offered 360 degree views across the Julian Alps. It was a sight to savour whichever way you looked. Re-checking our planned route off we were headed off the north side, which due to the ice we descended rather precariously to a col and a somewhat infamous gulley which can often be problematic. We had heard that it was passable but looking down I regretted bringing only micro-spikes rather than full crampons. Just as we plucked up the courage to start the descent an English couple who we’d been chatting to in the hut the night before joined us. The guy was a member of a MRT back home and equipped with a rope which he rigged to help our descent. At the bottom of the gulley the respite was short-lived as we had to traverse a precarious rock wall protected by a few staples and cable. We eventually made our way down to flatter ground and headed south-west with a more gentle decent to the Dolic hut (2151m) for a short break and a celebratory refreshment and then headed onwards towards another steep descent that took us towards the valley of the 7 lakes (although there are apparently 10 lakes in the valley). 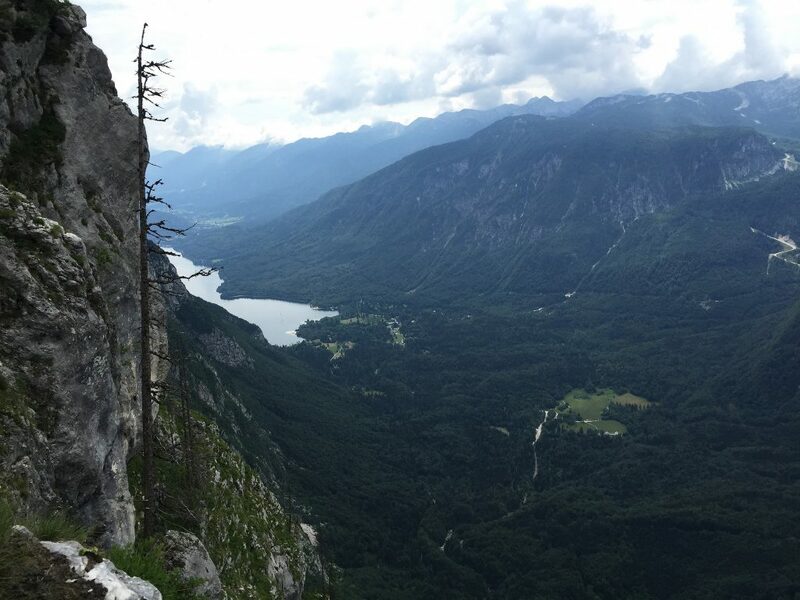 The contrast between the lakes, the green valley and the pure rock peaks was just stunning. My knees were now protesting at the continued descent so I was rather relieved when we arrived at Koca pri Savici Mt hut. We hadn’t booked but we managed to bag a small dorm to ourselves. It was only a short taxi ride back to Ljlubjlana where we would spend a night in jail – quite literally! We’d booked a room in Hostel Celica, a converted jail, but which retained the original cells replete with barred windows and doors. Ljubljana is a lovely place to spend a few days but though ours was too short a visit we’d earned some relaxation after a tough few days. For some more photos from the trip you can see my Flick album here. HI THERE. I am thrilled by your post. I am trying to find information on how to stay at the mountain hut up Mt Triglav. Any help appreciated. 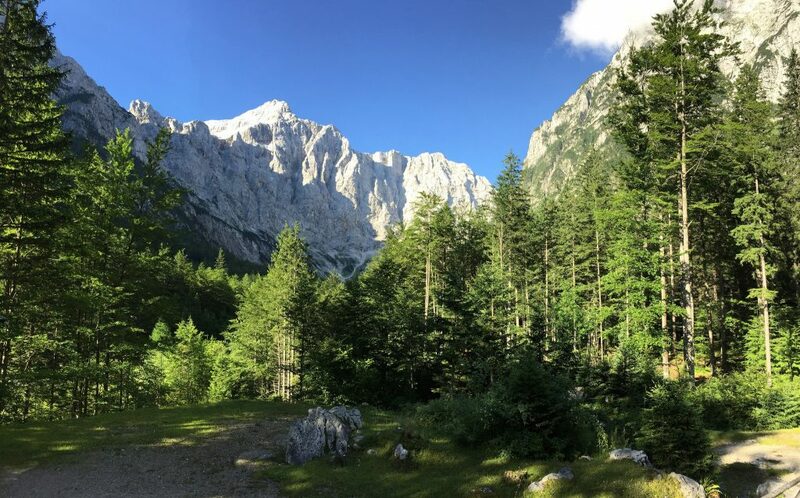 Hi Diana, there are several huts on and around Triglav. You don’t typically have to book in advance but we searched for the hut on google and emailed them in advance to book. Good luck, it’s a beautiful part of the world!